Saturday we visited our favorite little Asian Grocery store in Nanaimo, BC, and I couldn't resist what the Washington Post called the "cuteness quotient" of the baby bok (or pak) choy. 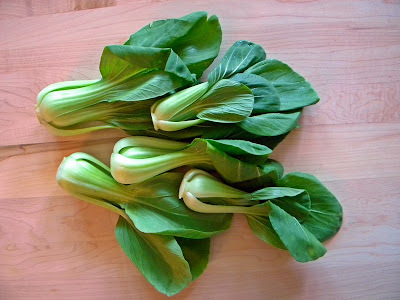 And, like other members of the brassica (cabbage) family of vegetables, bok choy provides lots of vitamin C, calcium, vitamin A, and glucosinolates, which may help prevent cancer. So, this green vegetable is more than just cute. Here's an easy, traditional home-style Chinese soup that showcases these little beauties! This makes a wonderful light lunch or supper. This recipe is adapted from a recipe in my book "Authentic Chinese Cuisine for the Contemporary Kitchen". If using the commercial fried tofu, pour boiling water over it, let stand for a few minutes, then drain it and squeeze out as much water and oil as you can. Cut the cubes in half. Have a large soup pot containing the broth heating at a simmer. Heat a large wok or skillet over high heat. When hot, add the oil. When the oil is hot, add the bok choy, dried mushrooms and fresh mushrooms. Stir-fry for 2-3 minutes. Divide immediately between four bowls and pass the sesame oil to sprinkle over each serving. Serve with a spoon and a fork! Use firm tofu. Cut the block in half crosswise, then each half in thirds horizontally. Then cut each piece into triangles. Place these on dark oiled cookie sheets and spray the tops with oil from a pump sprayer. Bake at 500 degrees F 5-7 minutes per side, or until golden and puffy. These may be frozen for future use. Instant broth powders, pastes, and cubes seem to be very regional. Many of my subscribers and readers use brands that I have never heard of, or cannot get here in my area of Canada. Brands of instant vegetarian broth, or bouillon, powders, pastes, and cubes seem to vary from region to region, even within North America. Many readers use brands that I have never heard of, or cannot get where I live in Western Canada. Fortunately, we can now order specific brands online if we can't convince our local grocer or health food store to carry the ones we like. #1 Seitenbacher Vegetarian Vegetable Broth and Seasoning Powder, a German brand which is widely distributed in the USA and in Europe. It is the #1 choice for the recipes in this book. 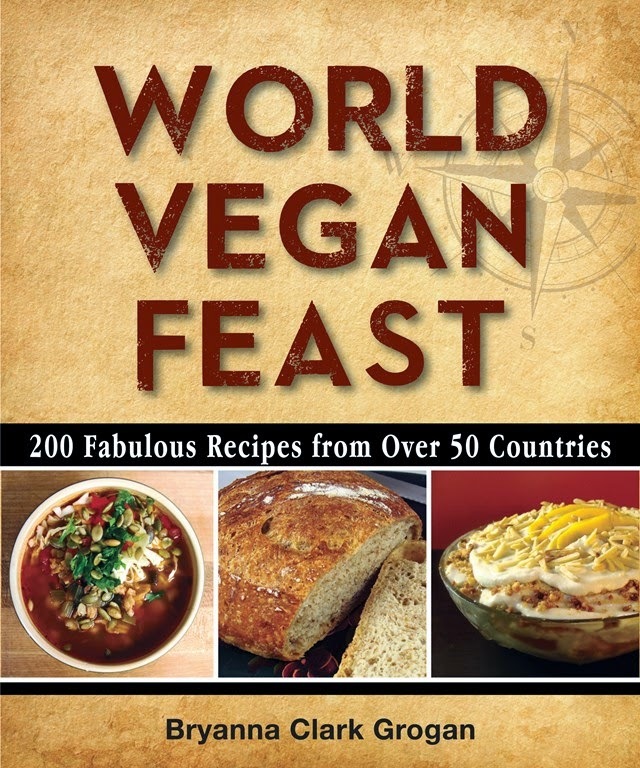 Unfortunately, I haven't been able to find it in Canada, but Canadians can order it from veganessentials and the shipping to Canada is very reasonable. #3: "Massel Vegetable Style Stock Powder", all vegan, MSG-free, palm oil-free and gluten-free, now available in the US and Canada from VeganEssentials.com, and also from amazon.com and many kosher outlets. There is Vegetable-Style, Chicken-Style and Beef-Style, all vegan. Massel broth powder contains no trans-fats, and has good flavor, without too much salt. TIP: Broth cubes almost always contain palm oil. #4: An excellent homemade alternative is my own broth powder mix. It's easy and cheap to make and has excellent flavor--but you must use 2 teaspoons for each cup of water. SEE RECIPE BELOW. I invented this broth powder when I was having trouble finding a natural broth powder here in Canada that actually tasted good! It's cheap and easy to make and has excellent flavor. You need to use twice as much of this homemade broth powder as Seitenbacher, but the sodium comes out about the same. You can adjust the salt to suit your taste and dietary needs, but I wouldn't go lower than 1 Tablespoon. Blend in a dry blender or food processor until powdery. Store in a dry, airtight container . Use 2 level teaspoons per cup of boiling water. Nutrition (per 2 tsp. serving): 28.4 calories; 10% calories from fat; 0.4g total fat; 0.0mg cholesterol; 475.3mg sodium; 163.9mg potassium; 3.6g carbohydrates; 2.0g fiber; 0.7g sugar; 1.6g net carbs; 4.1g protein; 0.2 points. 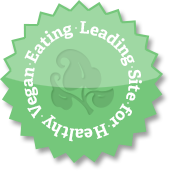 The next thing I want to share is something I posted in my newsletter, The Vegan Feast, a few years ago, but I wanted to try a fat-free version. It a big-batch, slow-cooker version of caramelized onions, which are so useful for making many dishes tasty (lots of umami!) It worked, but I think it was tastier with some olive oil. I also think, without the oil, you should use a sweet onion. CAUTION: This gets pretty odiforous while it's cooking, so I plugged the slow-cooker in (overnight) on my front porch! I must confess that, although I love caramelized onions (and they are a component of one of my favorite soups, onion soup), I didn't make them that often because of the time required stirring them so that they don’t burn! Well, here’s an easy, effortless way to make them, and you can make a whole lot of them if you have a large slow-cooker, and freeze small containers of it! Though many recipes say to use sweet onions, Vidalia onions, etc., I just used plain ol’ yellow onions with the oil version and they turned very sweet! However, as I mentioned above, I think the fat-free version would be better with a sweet onion. I used a 6 qt. 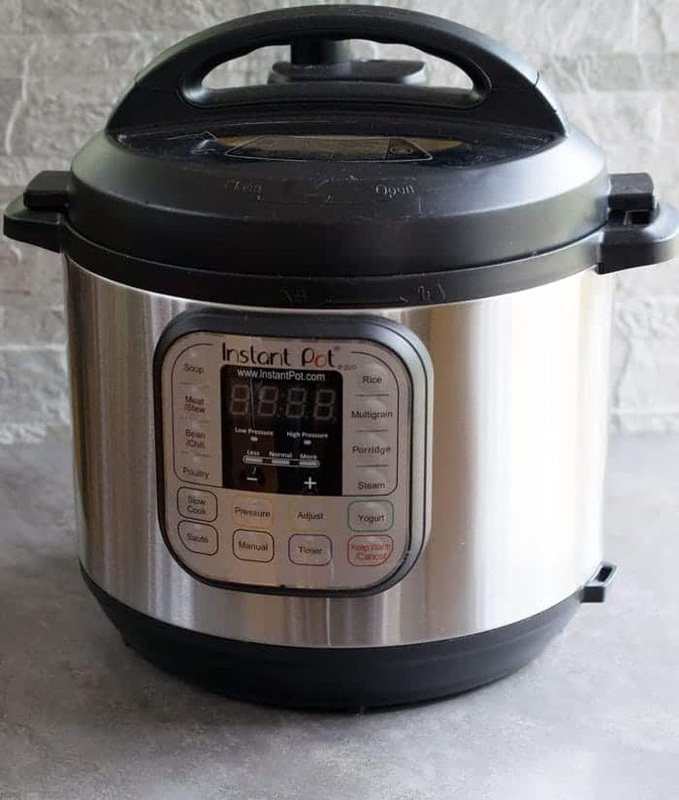 oval Rival “SmartPot” Crockpot (this is the newer version). Peel and slice 6 large onions. Slice about 1/4” thick. To keep your pot clean, line the bottom (with some about 2” up the sides, particularly in the corners) with cooking parchment, cut into an oval shape. THE OIL VERSION: Lay the onion slices on top and then drizzle with 2-3 Tbs. olive oil. Cover the pot and cook on LOW for 8 hours (I did this overnight). THE FAT-FREE VERSION: Mix the onion slices with 1-2 Tbs. brown sugar. Place them on the parchment. Cover the pot and cook on LOW for 8 hours (I did this overnight). Either way, they keep (in zip-lock bags)in the fridge for about a week, or freeze them if you don’t use them up. Now here is a vegan onion soup that you can make quickly if you have a batch of slow-cooker caramelized onions in your fridge or freezer. You can make it fat-free or not, as you like! Yes, you can make an excellent onion soup without beef stock. This recipe, spiked with wine, is very easy to make and makes an excellent light supper. This is actually a Northern Italian version of French Onion Soup, adapted from a recipe in my book "Nonna's Italian Kitchen". In a large heavy pot, mix the onion, the water, bouillon, Marmite, soy sauce, and salt. Cover and simmer for 30 minutes. Add the wine and simmer uncovered for about 5 minutes. Taste for seasoning and add the white pepper to taste. Toast as many pieces of bread as you need (cut rather thick). Spread with a bit of Earth Balance and sprinkle liberally with soy Parmesan (and other vegan cheeze, if you like). Place a piece of the toast (cut decoratively, if you like) in each serving of soup. Never heard of a "Nanaimo Bar"? Well, you kind of have to be Canadian! Named after the city of Nanaimo in British Columbia, which is just one hour's drive south of us on Vancouver island, they are a wildly popular item in coffee bars and during the Christmas holidays. The first time this square was published under that name was in the early 1950's in the Vancouver Sun newspaper. I believe it was for a recipe contest. I've always thought these were way too sweet, so I've been promising myself to make what I call a "grown-up" version-- vegan, of course, less sweet, with better ingredients, a little Kahlua, and a modern touch. Yesterday I worked on this as a Valentine's Day treat for my sweetie, and...success! 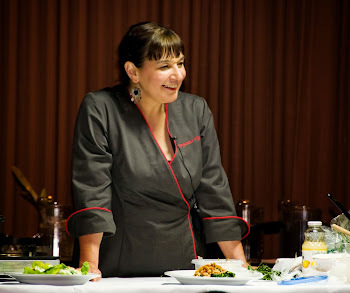 The recipe will be in a new book coming out at the end of 2010. Here are the Nutrition Facts: Nutrition (per bar): 142.0 calories; 56% calories from fat; 9.0g total fat; 0.0mg cholesterol; 100.3mg sodium; 45.9mg potassium; 13.7g carbohydrates; 1.1g fiber; 6.2g sugar; 12.6g net carbs; 2.0g protein; 3.4 points. I compared it with an ordinary Nanaimo bar and these have less sugar, less fat, NO cholesterol, and twice as much fiber and protein! "Breast of Tofu" Soft Tacos: corn tortillas heated quickly in a dry cast iron skillet, and filled with sliced pan-fried "Breast of Tofu" (which is in almost all of my books), organic baby greens, guacamole, vegan cheeze shreds (Galaxy Foods soy mozza singles, in this case), and salsa. A plate of stir-fried asparagus and mushrooms with garlic, roast potatoes, and a zucchini "meatloaf" that I devised for the Fieldroast book I'm working on-- very yummy, like a "turkey" meatloaf! NOTE: I FINALLY ORGANIZED THE RECIPE PAGE LINKS INTO CATEGORIES! "Being born a Rat is nothing to be ashamed of. In China, the Rat is respected and considered a courageous, enterprising person. It is deemed an honor to be born in the Year of the Rat and it is considered a privilege to be associated with a Rat. Rats know exactly where to find solutions and can take care of themselves and others without problems. They use their instinctive sense of observation to help others in times of need and are among the most fit of all the Animal signs to survive most any situation." Anyway, it is a time to party BIG TIME! It is actually two big celebrations in one—- New Year’s Day and everyone’s birthday! According to Chinese tradition, everyone adds one year to their age on New Year’s Day. It is also an important family get-together event, because one must try to see every family member face-to-face! Since Chinese families used to be large, and perhaps spread far apart, the New Year’s festivities used to last for a month, in order to see everyone! Now they generally last for about a week. On New Year’s Eve there is a huge family feast for as many members of the family as possible. The children get to stay awake all night, because the Chinese believe that the longer the children stay awake, the longer their parents will live! (Better not let that get around!) Red is a good luck color, so you will see red everywhere. The table for the feast is set with a red cloth and red candles. And, surprise! THE NEW YEAR'S EVE MEAL IS A VEGETARIAN FEAST! No meat is served because harm would have to be caused to obtain meat and this would be bad luck (too bad this doesn’t extend to the rest of the year!). Oranges and apples are the usual fruit, since apples are symbols of good luck and apples and oranges are both round (another lucky symbol) and are red and orange— colors of joy! Kumquats are another round, orange fruit that symbolize “golden luck”. Fresh bean curd or tofu is not included as it is white and unlucky for New Year as the color signifies death and misfortune. Candied lotus seeds symbolize more sons; watermelon seeds more children. These days, gold-wrapped chocolate coins symbolize wealth. Candied lotus root is for endless friendship, and coconut for good relations between fathers and sons. Sweet things are for the sweetness of life; dumplings represent wealth, and romaine lettuce is for prosperity. In other Asian communities that celebrate at the same time, many customs, such as cleaning the house, visiting, exchanging gifts of food and red envelopes of money, games of chance, fireworks, new clothes, etc.. are the same. Tibetans eat a special nine dumpling soup with fortune-telling tokens in them. In Vietnamese communities, there is a two-day holiday called Tet. Homes are decorated with peach blossoms, which represent peace and luck. During the two days of celebration no real cooking is done-- snack foods (such as steamed rice cakes) and sweets are eaten. But on the day after the official celebration there is usually a big family meal with traditional foods such as spring rolls. If you have a party, to find a book or website on Chinese horoscopes so that your guests can find their signs and predict their luck in the year ahead! Read more about this holiday here. Actually, textured soy protein is simply de-fatted soy flour cooked with water, then extruded through machinery to make granules, chunks, cutlets, etc., then dehydrated. Organic and/or solvent-free textured soy protein (TVP®, BTW, is the same thing, but it is a registered brand name, and is also the same thing as "textured vegetable protein" or TSP), is available! I also like a product called Soy Curls ®, which is like stir-fry strips. It is made from the WHOLE soybean (non-GMO). It is very tender and great for stir-fries, etc. Since it contains the natural oil, I keep this dried product in the freezer. Soy Curls® are solvent-free, and I use the crumbs on the bottom of the box sort of like TVP granules. As for commercial textured soy protein products, Nexsoy makes a commercial organic textured soy protein that manufacturers use for organic meat substitutes. "The unique Nexsoy® process is totally solvent-free, yielding a product line that is free of the "soy" taste that some consumers find unpalatable, leaving you free to work on developing your flavor, not masking agents. Traditionally, most soy ingredients are produced using a chemical solvent called hexane. This method is believed to be responsible for the "grassy" or "beany" flavor that has historically slowed the acceptance soyfoods. The Nexsoy® processing method is entirely mechanical and requires no chemicals such as hexane. This process is responsible for very neutral-tasting naturally-produced soy ingredients that can be used by food manufacturers without negatively impacting the flavor of their product." This recipe, from my book "Authentic Chinese Cuisine for the Contemporary Kitchen ", is more traditional than the usual pineapple version that North Americans are used to. It is one of the dishes I make once in a while with a fried ingredient because it is so good that way! I use a traditional wok for frying, because it is deep, but not wide, so you don't need to use cups and cups of oil. But there is another way as well! NO-FRY OPTION: Dredge your chunks is the starch as usual. Spread the chunks on a large cookie sheet sprayed with oil from an oil spray bottle/mister. Spray the chunks with a little oil. Place about 6 inches under your oven's broiler. Broil on high for several minutes (watching carefully so they don't scorch or burn) until they are crispy on top. Turn them over and broil briefly until the 2nd side is crispy. Remove from the broiler and proceed with the recipe. Roll the reconstituted soy protein (or seitan) chunks or Soy Curls® in cornstarch or water chestnut flour, shaking off the excess starch. Heat about a cup of oil in a large skillet, wok to 375°F. Fry the chunks in several batches in the hot oil until they are golden and crispy, then drain them on paper towels on a cookie sheet. Keep them warm in a 200°F oven. Heat a large wok, stir-fry pan or heavy skillet over high heat. When it's very hot, add the oil. When the oil is hot, add the onion, pepper, garlic, and ginger. Stir-fry until the onion starts to turn translucent, adding a few drops of water, if necessary to keep from sticking. Add the water chestnuts or celery, and the peas, along with the Cooking Sauce. Bring this to a boil, then stir in the thickener. Stir until it thickens and quickly add the warm fried gluten or soy protein. Stir well to heat through and serve immediately with rice. Nutrition (per serving): 352.4 calories; 41% calories from fat; 17.3g total fat; 0.0mg cholesterol; 172.7mg sodium; 857.5mg potassium; 39.7g carbohydrates; 2.5g fiber; 11.4g sugar; 37.1g net carbs; 15.9g protein; 8.0 points. Reconstitute the textured soy protein chunks by simmering 1 and 1/2 cups dry chunks in 3 cups water with 3 Tbs soy sauce, 3 Tbs ketchup or tomato paste, and 1 Tbs nutritional yeast flakes for 15-30 minutes, depending upon how tender you like them. Cool and store in the cooking broth. (I usually make 4 or more times this amount and freeze it in 2 cup portions.) Drain the chunks before using them, and pat them dry before coating with flour, frying, or marinating. This amount will yield about 2 cups reconstituted chunks. NEW YORK -- A friendly Super Bowl wager between the mayors of New York and Boston is pitting Manhattan clam chowder against New England clam chowder. Mayor Michael Bloomberg and Boston Mayor Thomas Menino are doing more than rooting for their hometown teams in the game between the New York Giants and the New England Patriots on Sunday. In the bet placed Tuesday, the loser will donate local foods to charity in the other mayor's city. If the Patriots win, that means Bloomberg will send a delivery to Boston that includes Manhattan clam chowder, pastrami sandwiches, New York pizzas, black and white cookies, New York steaks and a few gallons of lemon ice. And if the Giants claim victory, Menino will send a package with New England clam chowder, Dunkin' Donuts coffee, Boston cream pies, chicken sausages and Brigham's ice cream. Boston-born Bloomberg insists he is rooting for the Giants, and City Hall announced that the Empire State Building will glow blue this weekend to show solidarity for the team, which actually plays its games and practices in New Jersey. Dulse is a sea vegetable which is gathered on the Northeastern coast of North America, so I thought it would be an appropriate substitute for the clam flavor. This soup rivals calorie-rich and fat-laden version for flavor and texture. However, if you want some fat in this soup, saute the onions in a couple of a little dark sesame oil, which lends a rich, smokey flavor. In a medium-sized heavy pot, steam-fry the onions (See Cooking Tips below for how to steam-fry-- there is an option to steam-fry in a microwave, if you prefer) for about 5 minutes, or until softened. Add all ingredients except pepper, paprika, and Blended Mixture. Simmer, covered, for about 10 minutes, or until the potatoes are soft. Meanwhile, whip the Blended Mixture ingredients in a blender until VERY smooth. When the potatoes are soft, stir in the Blended Mixture, add pepper to taste, and heat gently. Add more broth if it's too thick. Sprinkle each serving with paprika. Serve with crackers. TO MAKE SOY-FREE: In the Blended Mixture, omit tofu and use 1 cup cooked short grain rice and 1/4 cup raw cashews (this adds about 10 g fat to the entire recipe). Nutrition (per serving): 172.7 calories; 8% calories from fat; 1.7g total fat; 0.0mg cholesterol; 690.3mg sodium; 621.0mg potassium; 27.5g carbohydrates; 2.5g fiber; 3.0g sugar; 25.1g net carbs; 13.4g protein; 3.1 points. One term that you will often see in my recipes is "steam-fry". It simply means sautéing or stir-frying without fat. To do this, use a heavy skillet or stir-fry pan, lightly greased with about 1/2 tsp. of oil. Heat the pan over high heat, add the chopped onions or other vegetables and one or two tablespoons of liquid (water, broth or wine), depending on the amount of vegetables. Cook over high heat until the liquid starts to evaporate, stirring with a spatula or wooden spoon. Keep doing this until the vegetables are done to your liking, add JUST ENOUGH liquid to keep the vegetables from sticking to the bottom of the pan-- you don't want to stew them! You can brown onions perfectly by this method. As soon as the natural sugar in the onions starts to brown on the bottom and edges of the pan, add a little liquid and scrape the brown stuff, mixing it into the liquids and around into the cooking onions. Keep doing this until the onions are soft and brown, being careful not to scorch them. TO "STEAM-FRY" IN A MICROWAVE OVEN, use a round microwave-proof, covered 10" casserole dish. Add your chopped onions, garlic, carrots, celery, etc.. Cover and microwave 5 minutes, or however long it takes to soften them. You can't actually brown onions, etc, this way, but you can thoroughly cook them through with this method and then finish browning them in a non-stick skillet. It works wonderfully well and you don't have to watch the veggies-- you can be preparing the rest of the recipe. Just add the softened veggies to the recipe. For devotees of the tomato-ey version, a spicy, vegetable-thick chowder. This soup is actually a derivation of an Italian soup. Some historians say that Manhattan clam chowder was originally called Coney Island Clam Chowder and/or Fulton Market Clam Chowder. Both of these names were used in the 1890s. The cookbooks written by Alessandro Filippini and Charles Ranhofer, who both worked at the famous Delmonico's Restaurant in New York at different times, were considered as most important cook books in modern cooking. They both contained versions of a tomato-based clam chowder. Since nearly everything that Delmonico's Restaurant served was widely imitated, it is certain that several New York upscale restaurants probably sold a version of tomato-based clam chowder, today known as Manhattan Clam Chowder. This soup is virtually fat-free. If you would like to add some fat to this soup, saute the vegetables in a couple of tablespoons of olive oil with a few drops of dark sesame oil. Mince the onion, carrot and garlic in the food processor, or by hand. Steam-fry the minced vegetables for about 5 minutes (See Cooking Tips above in New England Chowder recipe for how to steam-fry-- there is an option to steam-fry in a microwave, if you prefer) , or until softened. Add all the ingredients to a medium soup pot, bring to a boil, then reduce heat and simmer, covered, for 15 minutes. Serve hot. Nutrition (per serving): 124.3 calories; 5% calories from fat; 0.8g total fat; 0.0mg cholesterol; 655.8mg sodium; 770.2mg potassium; 23.2g carbohydrates; 3.9g fiber; 7.1g sugar; 19.3g net carbs; 6.7g protein; 1.8 points.